Guanyin is the deity of compassion and mercy protrayed in masculine form. Guanyin is sometimes known as Quan Yin, the deity in feminine form. The mosaic was inspired by a favorite sculpture of mine, Guanyin Bodhisattva, dated 907-1125, which resides at the Nelson-Atkins Museum of Art in Kansas City, Missouri. 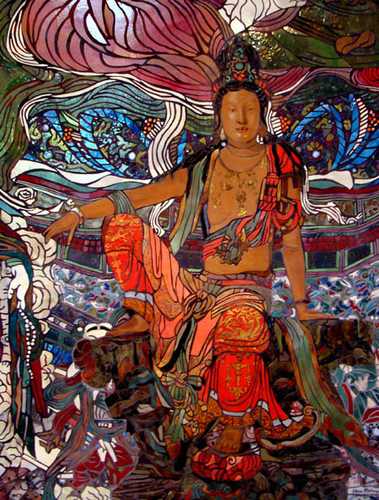 The background of my mosaic is of the Chinese wall painting, Paradise of Tejraprabha Buddha, dated 1279-1368.